We have developed a poster pack to raise awareness of the Find & Connect web resource which you can download and print from this page. The pack contains three posters and a fact sheet highlighting what it is, the major features, and how to use the website. We recommend printing the posters on A3 size paper or larger, and the fact sheets on A4 paper. Before printing, see the Poster Display Guidelines (1.3 MB PDF). 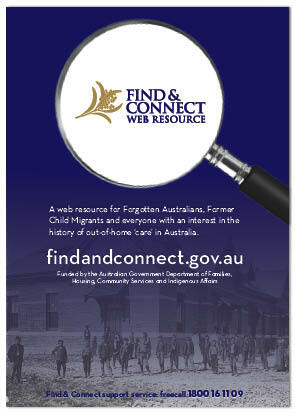 Download poster Find & Connect web resource (2.5 MB PDF). Download poster What’s it all about? (1.8 MB PDF). Download poster A Snapshot – What’s on the web resource (3.9 MB PDF). 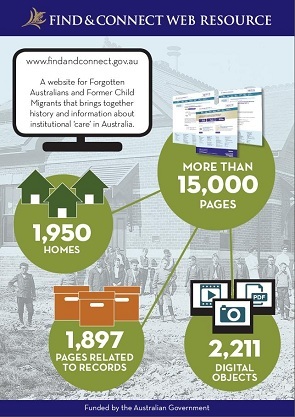 Download fact sheet Finding your way around the site (1.3 MB PDF). 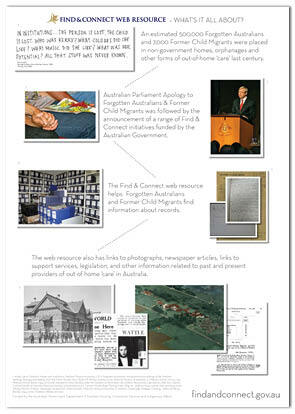 See more fact sheets on the Information about Records page.